When seeking energy efficient methods to regulate the comfort of your home, we strongly recommend considering a heat pump in Winnipeg. Similar to our air conditioners and furnaces, a heat pump’s main function is to provide and regulate the consistent flow of warm and cool air into your home. The team at Provincial Heating & Cooling suggests a heat pump as a more efficient alternative to traditional electric heating systems. How so? A heat pump serves the same function as an air conditioner during the summer months, but runs in reverse during the winter season to efficiently heat your home. When you visit Provincial Heating & Cooling to take a look at our selection of new heat pump units in Winnipeg, be sure to keep in mind the benefits of installing one! No Need for an Air Conditioner – Because a heat pump regulates the inflow of heat during the winter and cool air during the summer, there’s no need for a traditional air conditioner. Energy Efficiency – Our state-of-the-art heat pumps have the ability to reduce your electricity consumption for heating by nearly 50% compared to traditional heating sources such as furnaces. Reliability – Regardless of how severe the winter or summer temperatures may become, a heat pump is connected to a back-up system to guard against system failure. Additional Greenspeed™ Intelligence Heat Pumps Product Information. The Infinity series heat pump is part of an intelligent, communication system that delivers superior comfort, quiet performance and enviable efficiency in both heating and cooling modes. In fact, all Infinity models and sizes have earned the ENERGY STAR® qualification. Additional Infinity® Series Heat Pumps Product Information. Additional Performance™ Series Heat Pumps Furnace Product Information. Additional Comfort™ Series Heat Pumps Product Information. 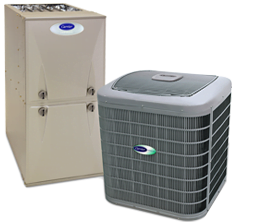 Provincial Heating & Cooling is your trusted source in Winnipeg for heat pump replacement. Whether your existing unit has become outdated, isn’t functioning properly or repair costs have become too much of a burden, our friendly and knowledgeable sales staff will help you select a new heat pump that fits your needs. Our team will ensure all of your questions are answered and that you have all the information you need to make a decision on a new heat pump! We encourage you to get started today by booking an appointment. You can do so by visiting our contact page for our phone number and other helpful information. We look forward to serving you!